*Today was a very gray, drizzly day in North Idaho. Paul and I embraced the day around noon by getting in the car and taking a more scenic road trip to Moscow this afternoon. It was our fourth Twelve Dates of Christmas date today. Instead of taking state highway 95 to Moscow today, we turned at the Rose Lake exit, and drove a different route. We took state highway 3 most of the way. *On our route we stopped and read signs about the Mullan Trail, and how the trail was originally built along the route of Highway 3. But there was too much flooding in that area, so they had to change plans and make the road north of Coeur d’Alene Lake, following more the route of Interstate 90. *We also read about the first mission, St. Joseph’s Mission, that was also built along that route. But, alas, flooding also plagued the Jesuits who built the mission, so then they decided to relocate, and build the mission near Cataldo instead. *As the rain poured down, we drove along the Chain Lakes (Rose, Killarney, Black, Cave to name a few), and eventually arrived in St. Maries. After St. Maries we traveled through Fernwood and past the Emerald Creek Garnet digs. Paul was a bit surprised when all of a sudden we came across a sign that said Shoshone County. He didn’t realize we would be driving through the southernmost tip of our county, and travel through Clarkia, Idaho. We eventually arrived in Latah County and drove into Bovill. When growing up and travelling to Orofino in the summers, we would sometimes take this route to see Grandma, and stop in Bovill to get some lunch, and for Dad to have a “cool one” at a local watering hole. *Bovill was also well-known when I attended the University of Idaho as the last stop in a route called the Bovill Run, a route that took you to Moscow and back, stopping at local bars along the way. *Today, Bovill is a sleepy little town of about 250 people. Now one of the attractions of visiting Bovill is the Camas Prairie Winery Tasting Room. 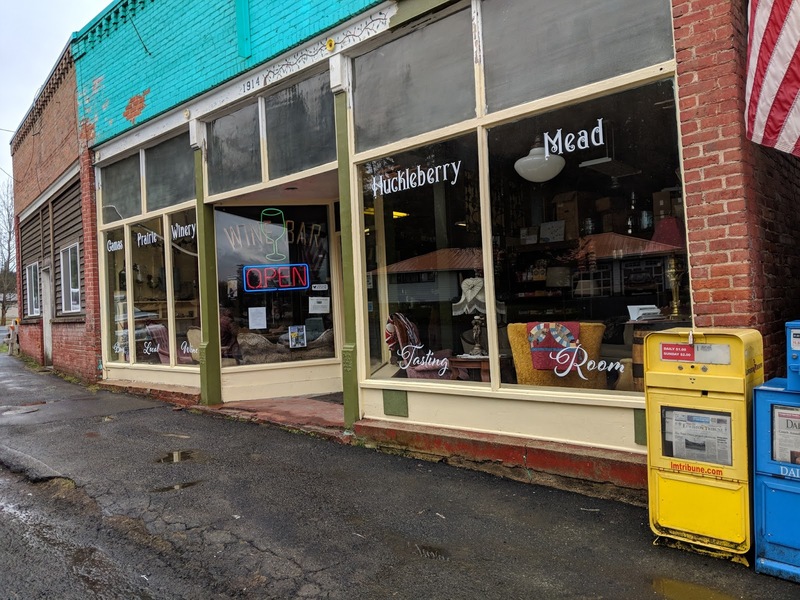 Located in an old grocery store in town, we went in and were greeted by some friendly locals who found Jeremy, the owner and operator of Camas Prairie Winery, and Jeremy showed us his list of wines and asked if we wanted to taste some options. I tried his Riesling and the Elderberry Mead. Paul tried the Huckleberry Mead and the Elderberry Mead. We both enjoyed our taste of Elderberry Mead, and purchased a bottle of it, and one of the Riesling. We visiting with Jeremy as he told us his story of being a home wine maker for years, and then started selling commercially. He used to have a tasting room in Moscow, but moved to Bovill a few years back, and said he actually gets more foot traffic in Bovill of people coming in to taste the wine than he did when it was located in Moscow. His specialty is Meads, a wine not made from grapes, but from honey and fruit. If you want to take a fun road trip along state highway 3, and stop to try some delicious wine, I highly recommend you stop and see Jeremy in Bovill, and do some tasting. You can find out more at https://camasprairiewinery.com/. *The rain let up a little bit as we left Bovill, and continued our journey toward Moscow. We left Highway 3, and turned onto Highway 8, and made our way through Deary and Troy, and eventually Moscow. When we arrived in Moscow, we decided to go to our favorite coffee shop, Bucers, and Paul and I each enjoyed a Breve. We texted the kids to let them know we were there and Molly and Travis came and joined us. Cosette was finishing up some laundry, and her and her friend Taylor would meet us later for dinner. Paul has found a new interest in flowers and trying to find different kinds of flowers to plant in our backyard. Bucers has shelves of books that you can buy, and he found a book about flowers that he purchased. *With my new way of eating, I now peruse menus to see what places fit with the food I now choose to eat. I looked at the menu for the Moscow Alehouse, and they had a few options that worked. So Paul, Travis, Molly, Cosette and Taylor all gathered at the Moscow Alehouse for dinner. I enjoyed a Portabello Mushroom burger, without the bun, and a nice side salad. It worked! The food at the alehouse was very good. *Cosette and Taylor left a bit early to get Cosette to the theater in Shoup Hall where she is part of a cast of seven actors presenting Ethan Coen’s play Almost an Evening. The cast did a really good job presenting this play in three acts and making the audience in this very intimate theater setting laugh throughout the evening. This was how the play was set up. Waiting – Someone waits somewhere for quite some time. Four Benches – His voyage to self-discovery takes a British intelligence agent to steam baths in New York and Texas, and to park benches in the U.S. and U.K. Debate – Cosmic questions are taken up. Not much is learned. *We left the theater around 8:45 p.m., and the rain was pouring down a we left the theater. We drove in what I would describe as a torrential rain storm until about Tensed, then the rain lightened up a bit. As we got closer to Coeur d’Alene, the rain stopped. *Earlier in the day, there was a post on Facebook regarding a wreck on the Fourth of July pass. This was posted around 5 p.m. As we approached the pass, one of the lighted highway signs said there was a wreck ahead and we could expect delays. When we got about to the top of the pass, we had to stop for about 20 minutes until the truck with the flashing lights in front of us guided us up and over the pass, and by where the semi-truck had wrecked. *We finally arrived home around midnight, and it was nice to be home. As I look back, throughout the rain, wine tasting, coffee drinking, time with family, dinner and theater, torrential rains and traffic delays, I was glad to spend the whole day with Paul.